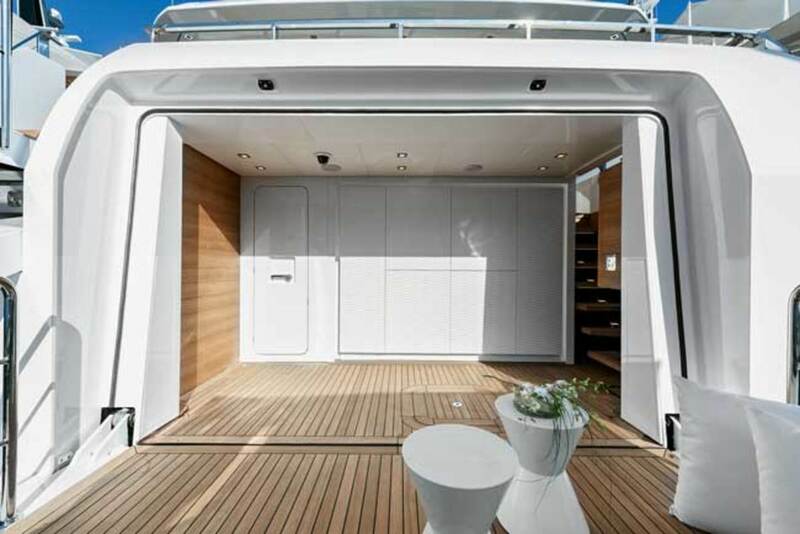 The interior designer of Entourage, a 154-foot, full-displacement trideck from Italy’s Admiral, spares no measure to let the sun shine in. It was Antoine de Saint-Exupéry, the eminently quotable French aristocrat, writer, poet and pioneering aviator, who said, ‘a designer knows he has achieved perfection not when there is nothing left to add, but when there is nothing left to take away.’ Paraphrased more prosaically as “less is more,” his words of wisdom are sometimes overlooked in the superyacht world, where opulence is easily mistaken for luxury—an error Dragana Maznic, the interior designer of 154-foot (47-meter) Entourage, was determined to avoid. Also influencing the interior design was Maznic’s own multicultural background. She was born in the former Czech Republic, she lived in Nice and Vienna, and she studied at the Parsons Paris School of Art & Design before joining her parents in Canada. 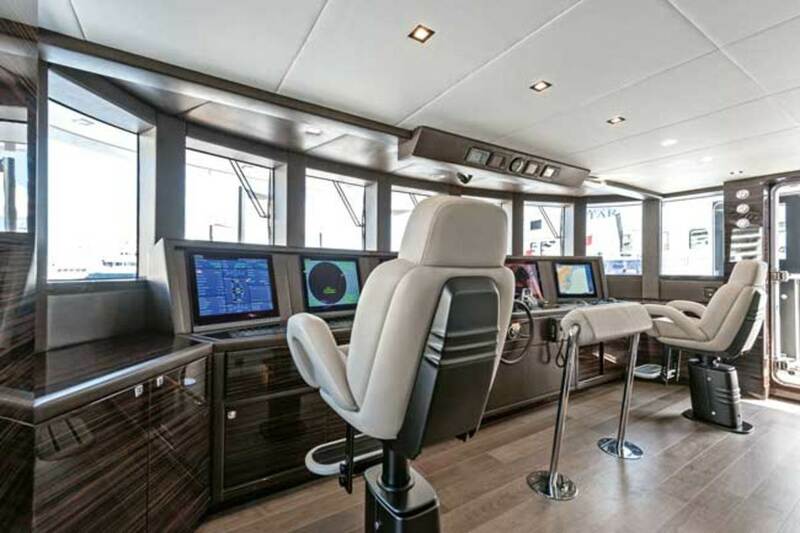 Among the most immediate benefits of Maznic’s “cutting away” exercise are the full-height windows in the main and upper deck salons. 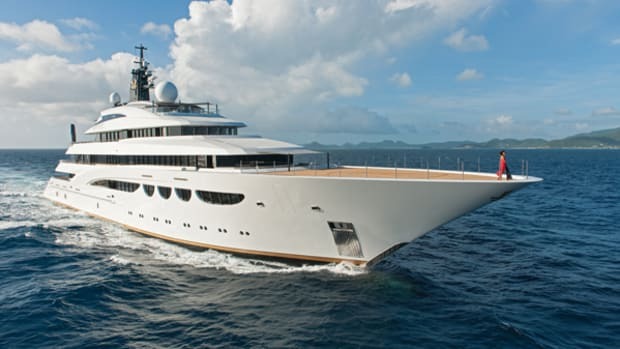 Considering the glazing is not structural, this is a remarkable achievement on a yacht of less than 164 feet (50 meters) that required some careful calculations on the part of the yard’s technical office. 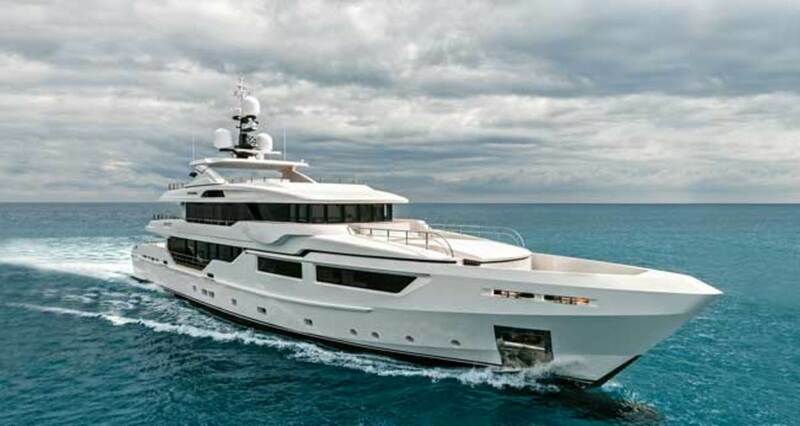 The panoramic views were further improved with cutouts in the main-deck bulwarks and sliding glass doors leading to a starboard fixed balcony. 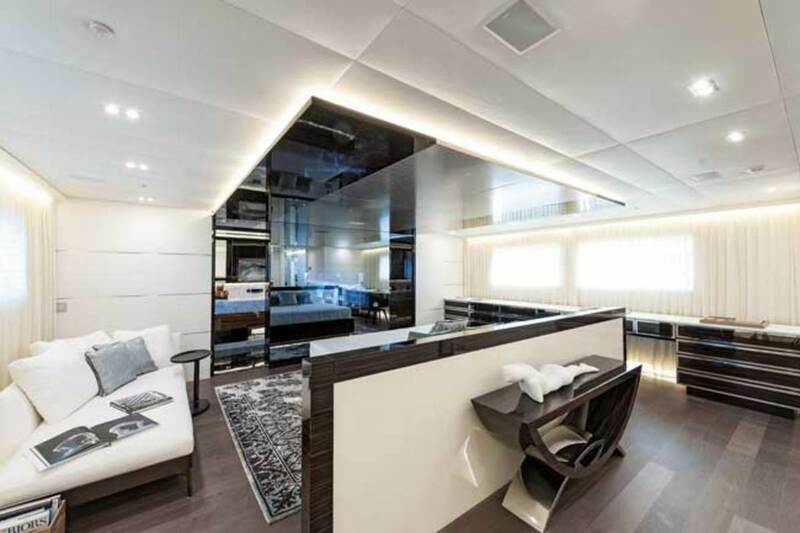 The interior décor is based on bleached ash veneers and white leather wall paneling combined with contrasting high-gloss macassar ebony and mirror-polished metal accents. The fabric tones range from earthy maroon and mocha to an airy light gray and aqua turquoise. Hand-woven mohair, wool, fur, linen and silk textiles are seductive to the touch and provide a sense of calming yet luxurious comfort. 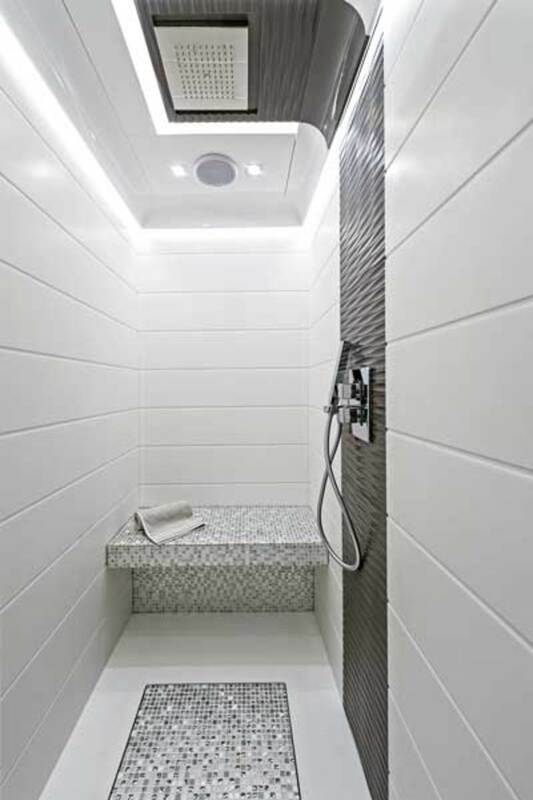 A warm platinum leaf is applied to the ceilings, while the parquet flooring is of taupe-colored Tabu, an engineered product made of Forest Stewardship Council-certified wood that is more resistant and easier to maintain than natural timber. 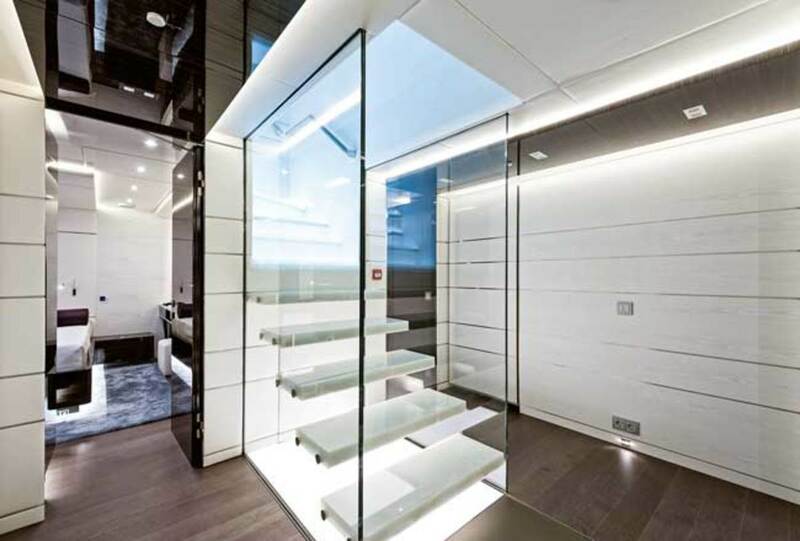 The stone varieties have been carefully selected for purity and quality with staircase treads of backlit white onyx that are cantilevered so they appear to float in space, and exquisitely book-matched nero portoro and white calacatta marble in the heads add a touch of romance and glamor. 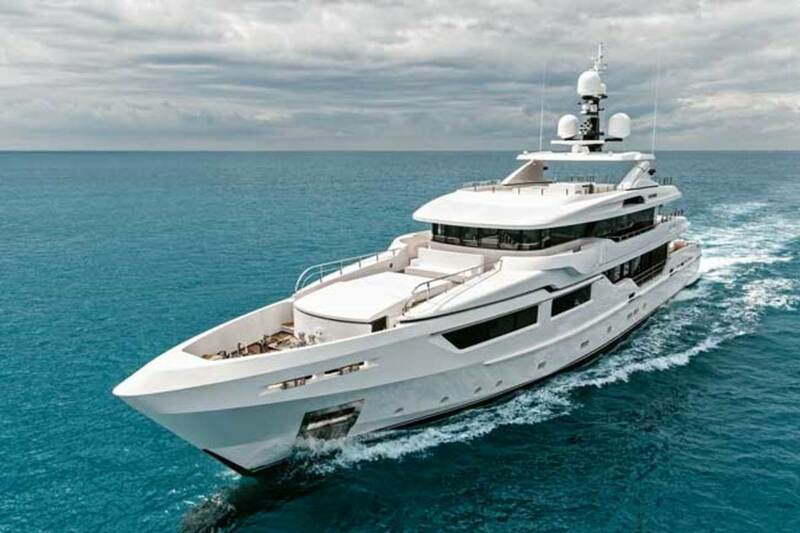 Entourage’s interior layout is fairly conventional, with the exception of the master cabin on the forward main deck. 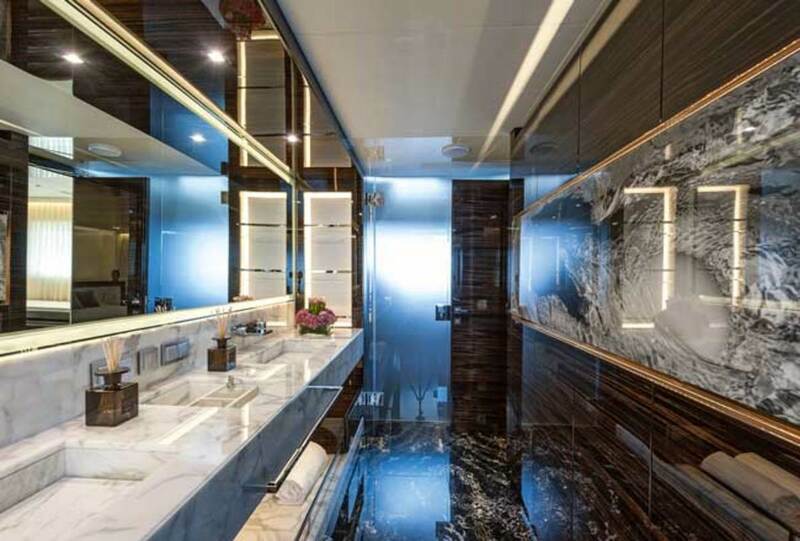 Entry to the suite from the foyer is via a light-filled corridor with a dedicated gym and steam room housed behind acid-etched glass on the starboard side (a second door with access to the owner’s cabin proper means that guests can also use the amenities without disturbing the owner). 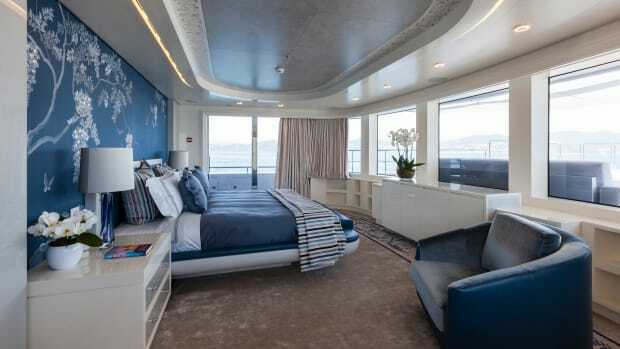 The cabin itself—all 861 square feet (80 square meters) of it—is dominated by a central king-size bed. The original design provided for a full-height, freestanding wall behind the bed, but this had the unwanted effect of bisecting the room, so it was reduced to a half-wall that doubles as a headboard. 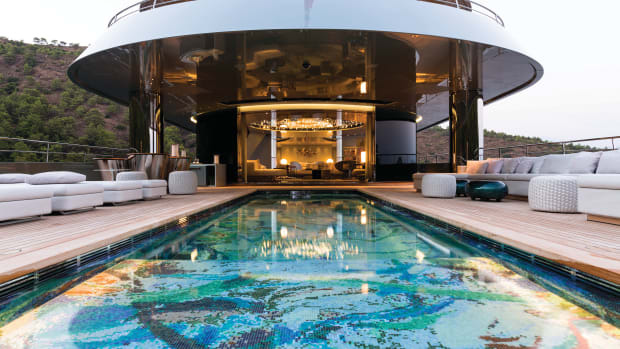 Works of art and sculpture by international artists and artisans, specifically sourced by the owner and Maznic, punctuate the interior design concept throughout the yacht as “extensions of the overall vision.” A glass sculpture by Canadian artist Catherine Hibbits that mimics wave forms is featured in the main salon; a metal and glass fixture resembling exploding shards of ice by Moss & Lam (also Canadian) runs the height of the stairwell; colorful abstract artworks by the Italian artist Vinicio Momoli decorate the walls of the sky lounge and lower-deck lobby; a large black-and-white print by American photographer Michael Dweck, part of his “Mermaids” series, is mounted in the owner’s head; and other limited-edition prints of swimmers, this time by sports photographer Jorg Badura, appear in the beach club on the lower deck aft. 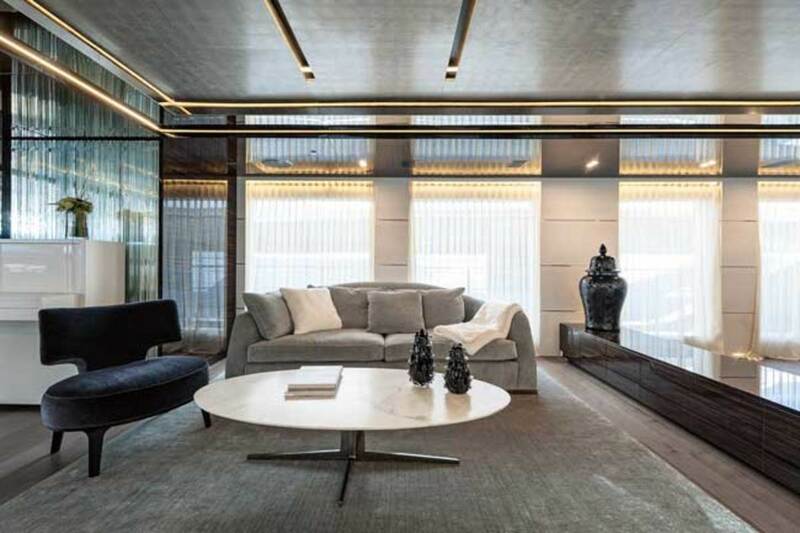 The fitted furniture has been reduced to a minimum; instead, all the freestanding furniture pieces are by leading designer names and brands such as Minotti, Giorgetti, Cassina, Artemide, Paola Lenti, Ross Lovegrove, Tom Dixon and Patricia Urquiola. 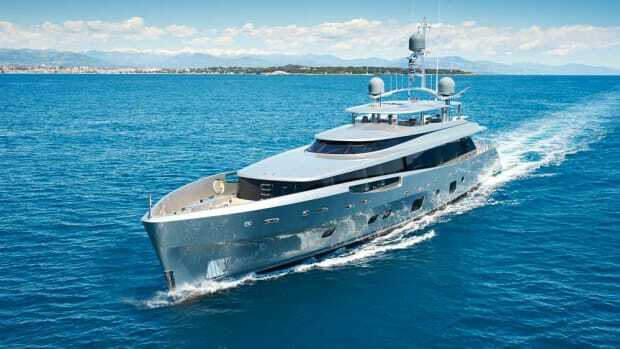 Maznic and Admiral Centro Stile also collaborated on bespoke exterior pieces such as the dining tables and sunpads. 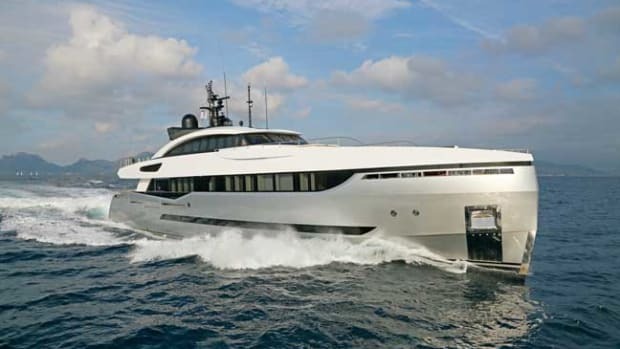 Exterior styling by Luca Dini follows a more traditional path compared with the lines of the Tecnomar Impero series, such as 131-foot (40-meter) Cacos V launched last year and new 121-foot (37-meter) Nono. 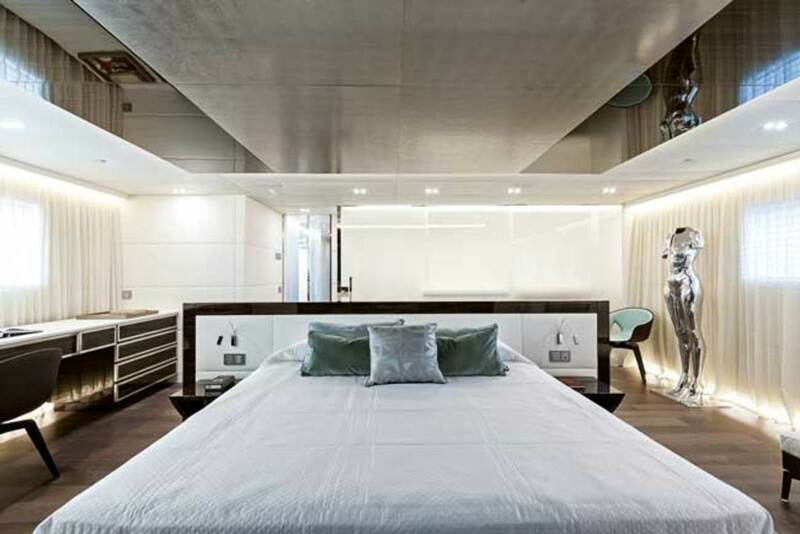 At 499 gross tons, Entourage scrapes the 500GT ceiling, the point at which classification criteria become more rigorous. Beyond the exterior styling, much of Dini’s initial design work focused on maximizing the interior volumes while remaining below the 500GT threshold. 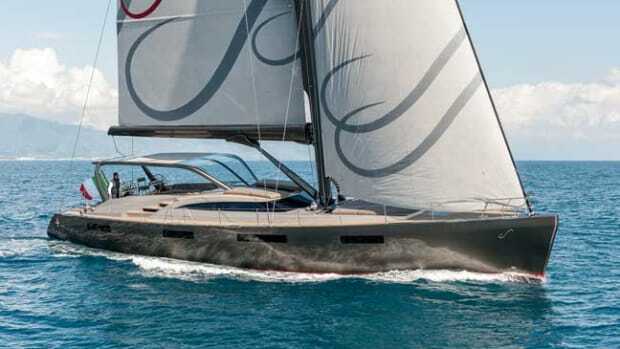 The result is a yacht that feels much larger than her overall length implies. 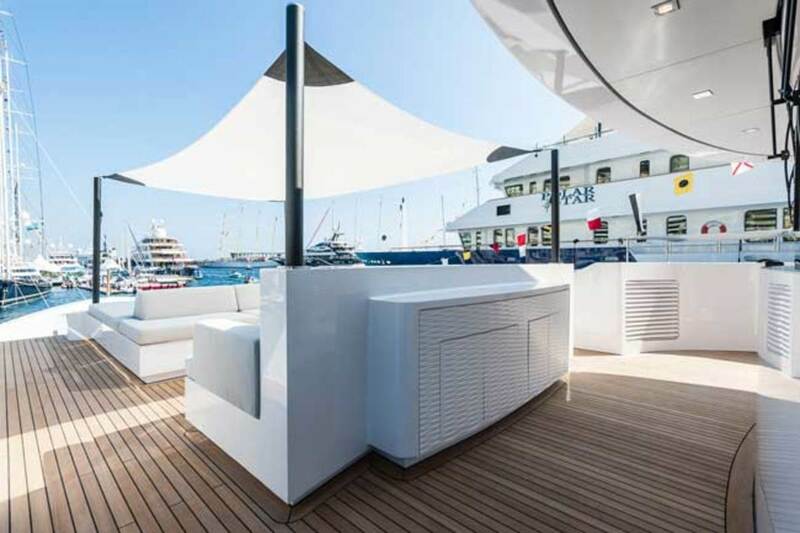 The sundeck is especially spacious (1,453 square feet/135 square meters) and will likely prove to be the focal point for open-air socializing. 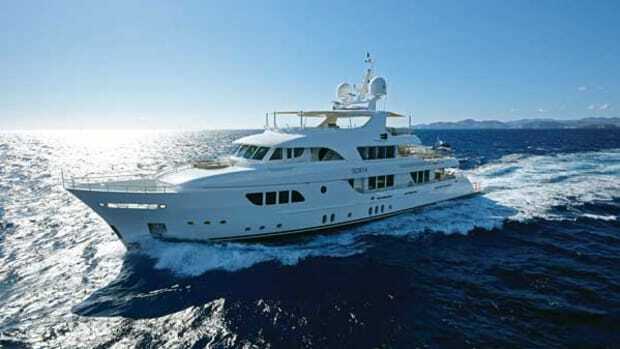 Equipped with a plunge pool and sunpads, TV, dining area and bar under the hardtop, and two oversized, circular sun loungers by B&B Italia, the space is what Maznic calls a “seductive sanctuary.” With the rescue boat stowed in its own covered bay on the foredeck and the guest tender and toys in the side-loading aft garage, all the open decks are clutter-free and can be devoted entirely to guest use. 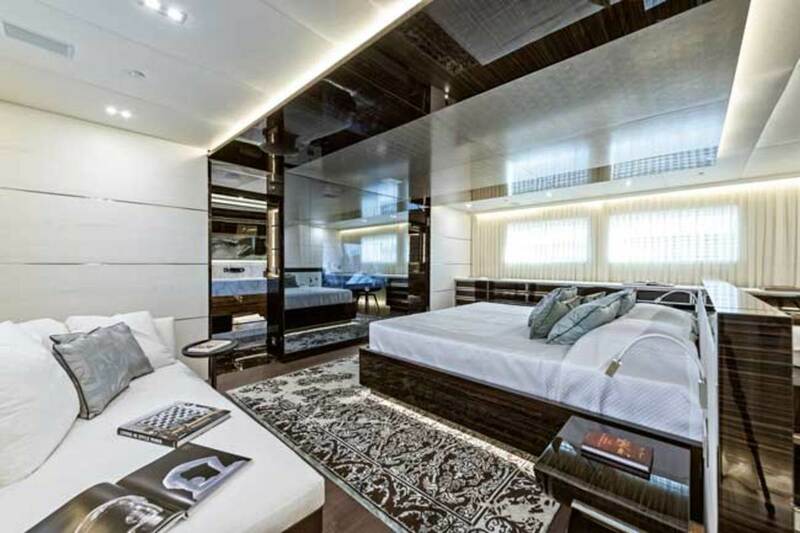 Also worthy of note are the crew quarters, which are finished in the same basic materials as the guest areas (although the practicality of macassar ebony in the galley is questionable). 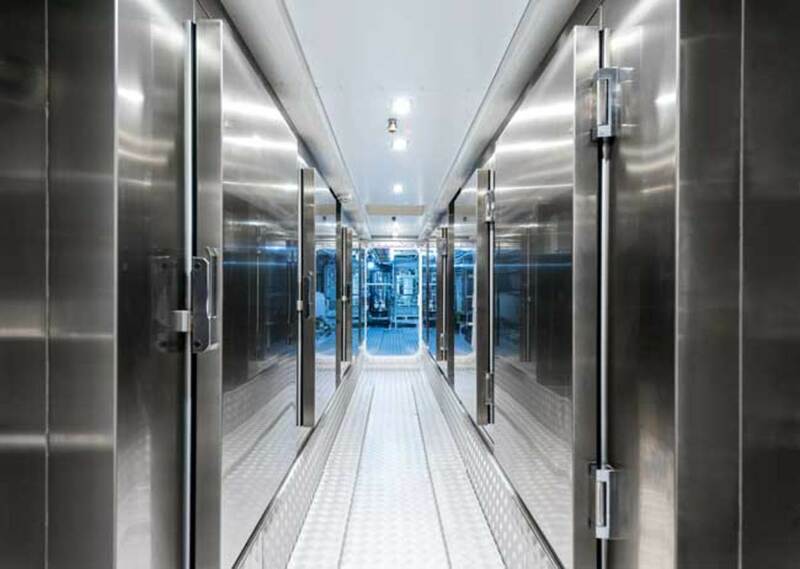 Next to the crew mess is a large linen room with access to the laundry and additional cold/dry stowage on the tank deck level, where there is more than 6 feet of headroom. 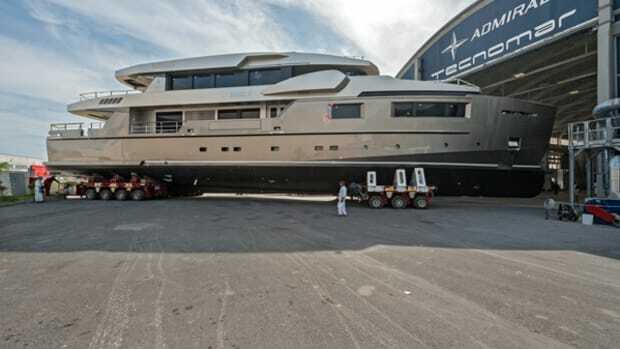 There is no shortage of European competitors for this type and size of yacht, but Entourage is the biggest of no fewer than six launches this year since Admiral Tecnomar rebranded itself The Italian Sea Group and moved into new and extensive headquarters in Carrara, Tuscany. 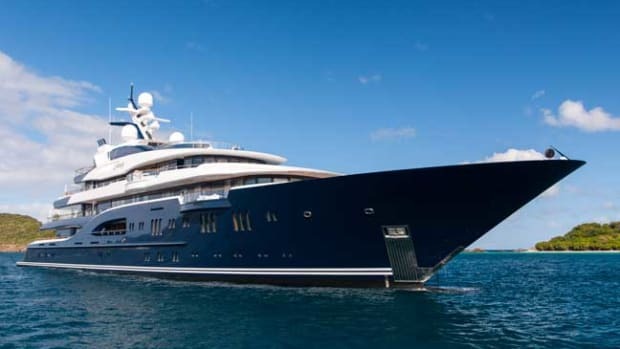 Entourage is a fine example of how the brand’s readiness to go beyond to satisfy owners’ demands is resulting in a burgeoning order book.